Ever Get Worm Dirt for Christmas? - JP loves LIFE! Have you ever gotten worm dirt as a gift? Some of you may wonder what the hell that question is about… I have to wonder if anyone (other than members of my family) answers yes! Yes, my sister gave me a bag of worm dirt for Christmas. She did it & now I’ve said it. In the past couple of years, my younger sister Leslie has found a lot of enjoyment from having a backyard garden (you can read a previous post on the topic–it includes a video too). And she’s done a number of other things that are related to exploring and understanding soil, plant growth, etc. One of the biggest projects was for her (I think) fifth grade students. They did a worm farm. LOTS of worms. The kind of worms that would make a fisherman happy. She has kept the worms going. She carefully packed ziploc bags of worm dirt and gave them to family for Christmas. But this was in no way her version of coal! Quite the opposite in fact! The worm dirt she gave us was added to house plants, flower boxes, etc. and has given many of our plants a boost. What about you? Do you think of worms as more than bait? 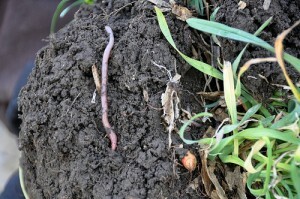 Ever thought of worm dirt as a Christmas gift? Worm dirt is very good! Though I have not actually “bought” any, I remember how very rich my dad’s worm bed was. He kept a worm bed so they would be very readily available when the urge to go fishing came upon him. Which was often. I also used to dig for worms when very young so we could have some for fishing. We loved to fish.